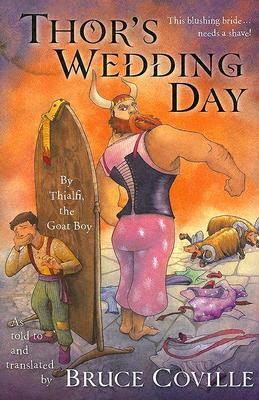 THOR'S WEDDING DAY is told from the perspective of Thialfi- a boy being punished for his sins by becoming the keeper of Thor’s goats. Thialfi’s main goal in life is to shovel goat dung and not get into any further trouble with the god of thunder until there’s no more dung to shovel (kind of a hard task seeing as the goats keep getting resurrected after they die). Through no fault of his own (or at least, no fault he’s willing to admit to) Thor’s hammer has gone missing- stolen by a giant- and Asgard is in a right tizzy over the whole affair. The giant, Thrym, is more than willing to return Thor’s hammer if only he can convince the lovely (though admittedly hot headed) goddess Freya to become his bride.